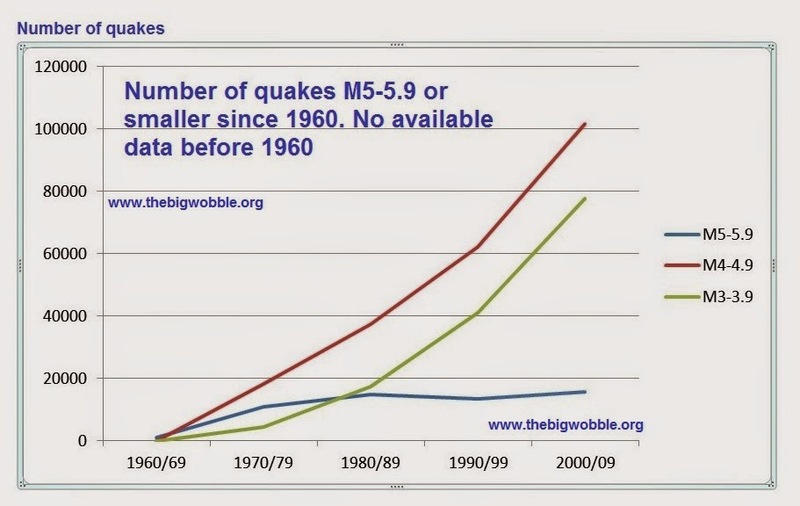 The Big Wobble: Large earthquakes have risen by over 450% since 1900 but thats not the whole story! 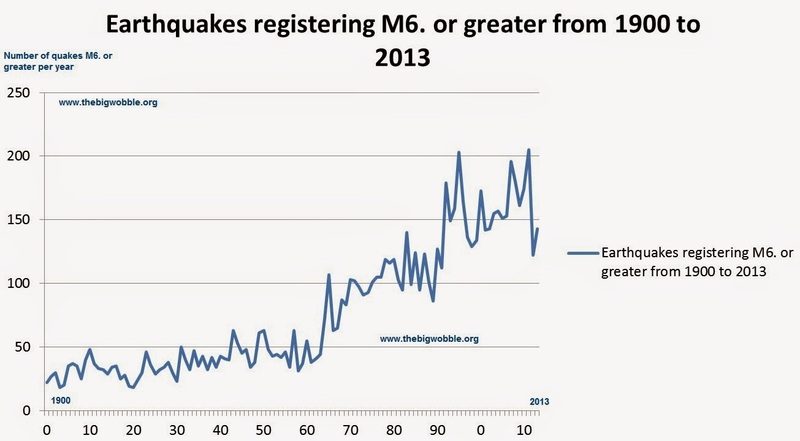 Large earthquakes have risen by over 450% since 1900 but thats not the whole story! 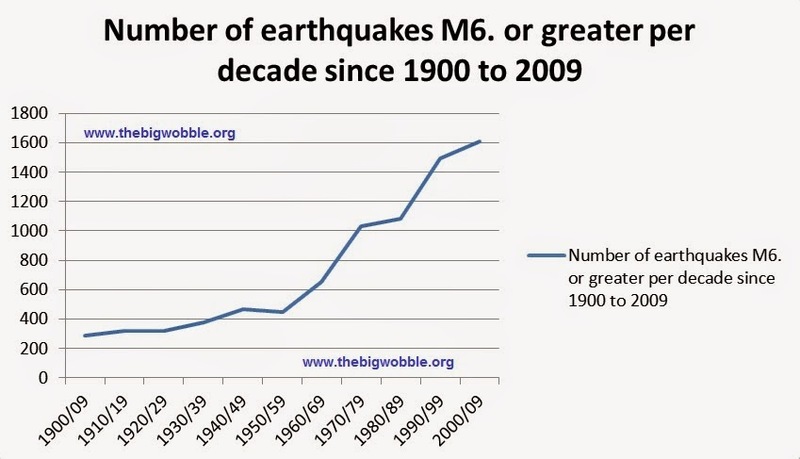 We are often told earthquakes have increased but without the actual facts, so I have done some number crunching and gone all the way back to 1900 to the present day, you might find what I have discovered interesting! More than 2000 years ago Jesus was sitting on the Mount of Olives when some of his disciples asked Him, "what will be the sign of your coming and of the end of the age?" He answered, "There will be great earthquakes, famines and pestilences in various places, and fearful events and great signs from heaven". Famines in 3rd world countries are so common they are hardly mentioned in the media these days, pestilences are all too topical at the moment with Ebola gripping the world with fear, Dengue fever on the rise in Asia and Enterovirus D68 targeting the kids in the US. ISIS amongst others are providing the fearful events and you could say the extreme weather we are witnessing and the recent blood moons are great signs from heaven. I wondered though, earthquakes have always been around, are we seeing stronger and more frequent earthquakes? 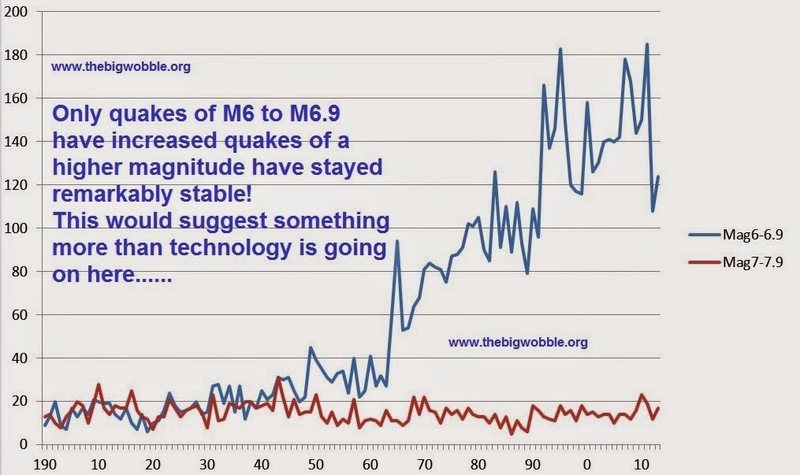 I know many of you at this point will be thinking yes but the technology is better now and we probably have more monitors, well yes I would agree but for another staggering fact, only magnitude 6 to 6.9 have increased, earthquakes of magnitude 7 to 9.9 have remained incredibly stable, see below. the years 2010 to 2013 are so far averaging 161. Earthquakes around the globe then are indeed increasing rapidly except, it would seem for earthquakes in the category M7-7.9 for some strange reason? You and Carol are a real team. I hope to hear more dialogues between you. Keep up the good work. Extinction is not a pretty subject but I feel you are doing it justice and keeping a positive outlook. Making the most of our brief stay here is something for which to strive.